Industrial ecology aims to reduce the environmental impact of industry by examining material and energy flows in products, processes, industrial sectors, and economies. Industrial ecology provides a long-term perspective, encouraging consideration of the overall development of both technologies and policies for sustainable resource utilization and environmental protection into the future. It emphasizes opportunities for new technologies and new processes, and those for economically beneficial efficiencies. Industrial ecology draws on and extends a variety of related approaches including systems analysis, industrial metabolism , materials flow analysis, life cycle analysis, pollution prevention, design for environment, product stewardship , energy technology assessment, and eco-industrial parks. Greater material efficiency, the use of better materials, and the growth of the service economy can contribute to the "dematerialization" of the economy. Resources that are cheap, abundant, and environmentally benign may be used to replace those that are expensive, scarce, or environmentally harmful. Such a substitution can be seen in the many important changes in energy sources that have occurred over the past century. As the energy sources have shifted from wood and coal toward petroleum and natural gas, the average amount of carbon per unit energy produced has decreased significantly, resulting in the "decarbonization" of world energy use. Another strategy for reducing environmental impact is the substitution of services for products, meaning that customers do not seek specific physical products, but rather the services provided by those products. For example, an integrated pest management service might provide crop protection rather than selling pesticides. The service thus saves money by using only as much pesticide as needed. power plants recycled in fertilizer may contaminate soil. However, in some cases, such waste reuse can be successful. 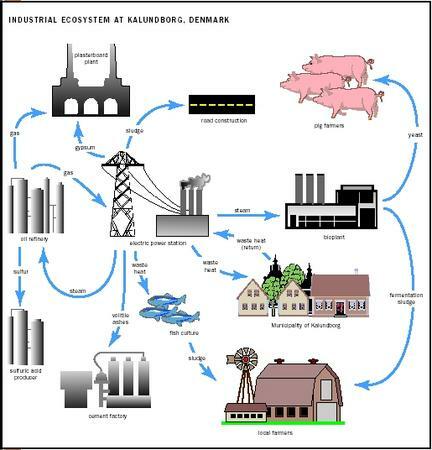 In the industrial district in Kalundborg, Denmark, several industries, including the town's power station, oil refinery, and plasterboard manufacturer, make use of waste streams and energy resources, and turn by-products into products. There are many examples of technological innovations that have had significant environmental benefits. An important example is the replacement of chlorofluorocarbons (CFCs) with new compounds in order to protect the stratospheric ozone layer. Other examples are the elimination of mercury in batteries, and the elimination of lead in gasoline, paint, and solder. The challenge of industrial ecology is to understand how technological and social innovation can be harnessed to solve environmental problems and provide for the well-being of the entire world. SEE ALSO C HLOROFLUOROCARBONS (CFC S ) ; I NDUSTRY ; L EAD ; L IFE C YCLE A NALYSIS ; R ECYCLING ; R EUSE . Frosch, R.A., and Gallopoulos, N.E. (1989). "Strategies for Manufacturing." Scientific American 261(3):144–152. Graedel, T.E., and Allenby, B.R. (1995). Industrial Ecology. Englewood Cliffs, NJ: Prentice Hall. Socolow, R.; Andrews, C.; Berkhout, F.; and Thomas, V., eds. (1994). Industrial Ecology and Global Change. New York: Cambridge University Press. Journal of Industrial Ecology. MIT Press. Available from http://www.yale.edu/jie . Every one understand that we should have alternate technologies and we have developed these technologies and these are working well but due to certain powerful agencies which are hurdel to launch these teconologies [awareness. This attitude will finish everything and peoples will be in great trouble when they are not aware of alternate technologies and it will be very much difficult to adopt sudden changes. So this is the high time to develop awareness and to push to launch new alternate technologies to sustain. For example to harvest the rain water so that the ground water levels remain static; Bio-compost; Bio-pesticides and nutrients derived from naturally occuring salts use in agriculture are needed very much.